As the crowd shuffled into Brighton Music Hall on a rather chilly fall evening, special guest Jacques (the opener and a semi-member of La Femme) was already bumping homemade rhythms composed through the manipulation of the various complicated musical keyboards and mixing equipment which were tangled around him. The first thing everyone noticed about Jacques was his haircut – he had short blonde hair on the sides but a (purposeful) bald strip through the middle of his head. As Jacques turned the knobs on his mixing board, his two-sided hair jiggled along with his funky dance moves. With every forceful foot stomp and arm rotation, his facial expression would change; from sticking his tongue out, to grinning like a child, to making a disgruntled face that depended on every beat of the bass: Jacques embodied the funky tunes he was producing. It didn’t take long for the crowd to pick up on Jacques’ groovy vibes – as more and more people began to fill up the venue, their heads began bobbing along. As I turned to glance around I realized that the female lead singer of La Femme, Clémence Quélennec, was standing next to me, grooving along to the music and swaying from side to side. Before I knew it, the entire crowd had picked up the beat and was moving along as well – something that is usually rare for an opening band to achieve. As I looked back towards the stage, I realized that the sounds Jacques was mixing were actually a concoction of recordings of obscure objects making noise such as a chicken doll squeaking, scissors cutting, and dropping a metal chain into a metal bowl, and then adding effects onto them and looping them on top of heavy electronic bass. At one point Clémence Quélennec jumped on stage, grabbed a guitar, and started improvising guitar riffs to match the beats Jacques was creating. Marlon Magnée, the male lead singer and one of the keyboardist of La Femme, also joined in with a guitar. The momentum of the crowd’s energy was already unstoppable and La Femme had not even officially started their set. As Jacques’ set ended and La Femme’s set began, they wasted no time diving into the first song, ‘Sphynx,’ from their most recent album, Mystère. Fitting for a song about dancing while tripping on acid, the crowd was dancing in a collective manner that seemed as if everyone was experiencing a heightened state of consciousness. The steady keyboard allowed for seamless transitions in the song that escalated the crowd’s swaying into full blown movement as more layers of synth were added on top of the guitar rhythm. Quélennec’s silky voice serenaded the listeners as she gracefully danced on stage, her arms moving effortlessly while the subtle glitter on her face and neck reflected the soft purple lighting being projected onto the stage. Caught up in the current of her arms the front row reciprocated her movements like the tide pulling the ocean. For their third song, ‘Où va le monde,’ it took only the first strum of the guitar to summon shouts of excitement from the crowd. Magnée took the mic from its stand and stepped away from his keyboard. He approached the edge of the stage, getting incredibly close to myself and the rest of the onlookers. As he twirled his hands along to the chord progressions of the song, he was practically touching the audience. Hearing the mostly English-speaking fans try to sing along was almost comical. Thankfully, the music was loud enough to drown out the garbled attempt at French from the crowd. 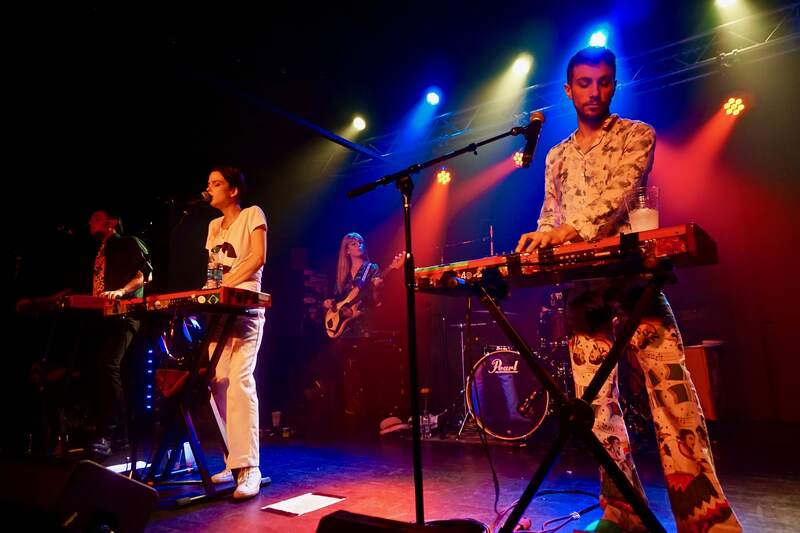 La Femme surprised the audience with a new song, ‘Cool Colorado,’ and everyone reacted with the same excitement that they had shown with their favorite hits. There was not a single lull in the synchronized dancing throughout the entire crowd. Immediately following their new song, the crowd only momentarily paused for the intro of ‘Exorciseur.’ Towards the middle of the song, Quélennec busted out some insane raps in French that once again rallied the crowd into cheering and clapping. Shortly after the end of ‘Exorciseur,’ ‘Sur La Planche,’ a hit song off of 2013’s Psycho Tropical Berlin, started with the recognizable steady drum kick and the crowd once again started shouting out of excitement. As the song progressed, people in the crowd began jumping to the beat and clapping along to the rhythm. The fast pace of the song lended itself to more rapid dance moves by both the band and the audience. For a change of pace following ‘Sur La Planche’ and ‘Nous etions deux,’ La Femme performed what they called a “country song” with a slower drum beat and softer guitar melodies. The slowness of the song was perfectly timed for everyone to catch their breath after dancing like maniacs – but the break didn’t last very long. Jacques made a special appearance for the last few songs of La Femme’s set, playing backup guitar and seemingly improvising along with the songs. When La Femme exited the stage after a solid set of 15 songs, the crowd was not ready for them to be done. Everyone began chanting ‘Ole! Ole! Ole! Ole!’ to encourage the band to come out for an encore, it became very clear that it was only a matter of time before they returned to the stage. The two encore songs, ‘Vagues’ and ‘Antitaxi,’ were polar opposites but entirely complementary in pace and the crowd reacted as such. ‘Vagues,’ meaning “waves” in English, caused the audience to sway back and forth as if being taken up by waves in the ocean. Everyone raised their arms and moved them side to side along with Jacques who was leading the crowd’s movement from the window above the stage. The softness of the song was truly the calm before the storm of ‘Antitaxi,’ one of La Femme’s most climactic songs that was a perfect ending to their hour and a half long set. By the end of the show the crowd was sweating profusely from nonstop vigorous dancing for the entirety of the show – from Jacques’ experimental opening set through La Femme’s psychedelic tunes. La Femme managed to keep everyone moving even with their slower songs; if people weren’t dancing like there was no tomorrow, they were swaying along to the music. Overall, Jacques and La Femme’s show at Brighton Music Hall was the most exciting and energetic show I have been to in the past year, with a crowd that was just as enthusiastic as the musicians.